If you have ever been to the Museum of Fine Arts in Boston, you have no doubt seen the painting above. I’ve only been there once and the image of this painting and its strong presence in the space really sticks in my mind. It was painted in 1863 by artist Elihu Vedder, an American expatriate who lived and worked in Italy for over 60 years. 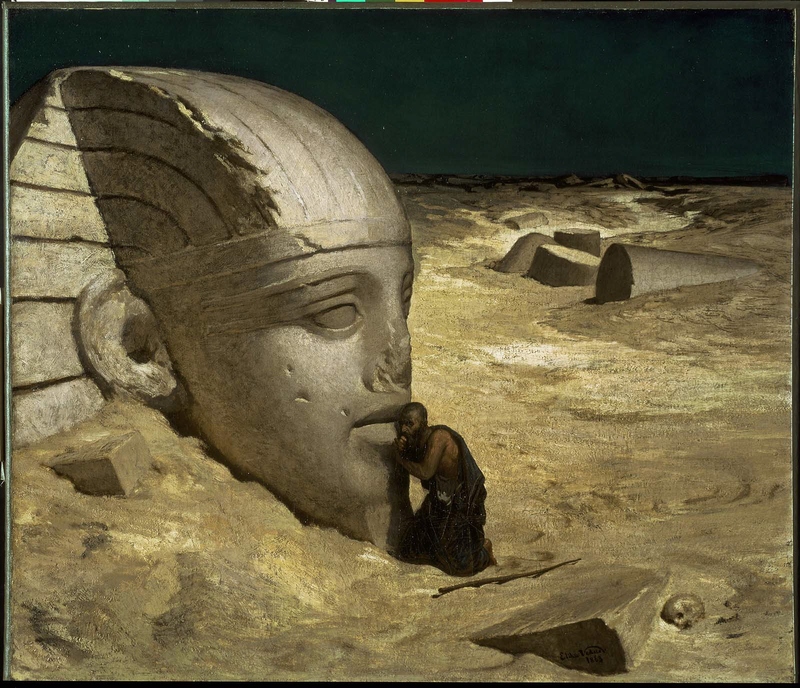 Its title is The Questioner of the Sphinx and it shows a man listening intently at the lips of the ancient monument with the hope, no doubt, of hearing some eternal truth. The skull in the sand makes clear that the Sphinx will not easily relinquish its secrets. The kneeling listener is said to represent man’s futile desire to find immortality. With the still sand covered Sphinx and the scattered toppled columns, the painting presents us with echoes from ancient history of once mighty empires that are long fallen and forgotten. It is reminiscent of Shelley’s great poem, Ozymandias, shown above, that speaks to the hubris and folly of those who think they can lord over this world. This was painted at a time when the US was in the midst of the Civil War and there was great doubt as to whether the county would be able to endure the struggle. The US was not an empire at that point. It was still young and finding its way but we still represented a great triumph of democracy, a country ruled by its people and not kings or dictators or despots– a rarity in the whole of history. But in that civil war we found ourselves in an existential crisis, a tipping point, that put us in peril of being consigned to the dustbin of history before we even grew into any form of our potential. I write about this painting this morning because it feels to me that we are again at a tipping point, divided in many ways as a country. It feels like there is going to soon be some sort of revelation that is either going to set us on a course that will either allow us to continue to grow our American experiment or will cause us to plummet into a darker and much more dangerous future. It all hinges on people who are ethical and principled standing up and doing what is right and exposing the truths of our time. But in the meantime, I find myself feeling like that man with his ear anxiously pressed to the lips of Sphinx. I’ve had more than enough on my plate this year without even coming near the political/social situation our country is in thanks to the royal mess in Washington as personified by that loose cannon in the Oval Office. The painting you show reminded me of a long-time favorite “Egyptian” painting of my own, “Rest on the flight into Egypt” by Luc-Olivier Merson. It features a sphinx statue, that had baked in the desert sun all day now in the chill desert night radiating back its sun-gathered warmth to warm mother and child. It’s a magical image. That’s a very interesting painting! There’s something about the Sphinx that speaks to every age, isn’t there?